How to relaunch an 800-year-old, deeply conservative and inward-looking industry? A group of enlightened individuals and institutions in Venice have come to their help, with exhibitions, ideas, marketing and international clout. In 2016 there were 263 glass-making enterprises on Murano, 125 fewer than in 2010. The economic decline was in part of their own making, for in the 1990s they began to cater for the growing number of tourists by making small souvenirs. But then the Chinese flooded that market with cheap replicas and now nearly all the knick-knacks for sale in Venice and even on Murano are these Chinese “fakes”. 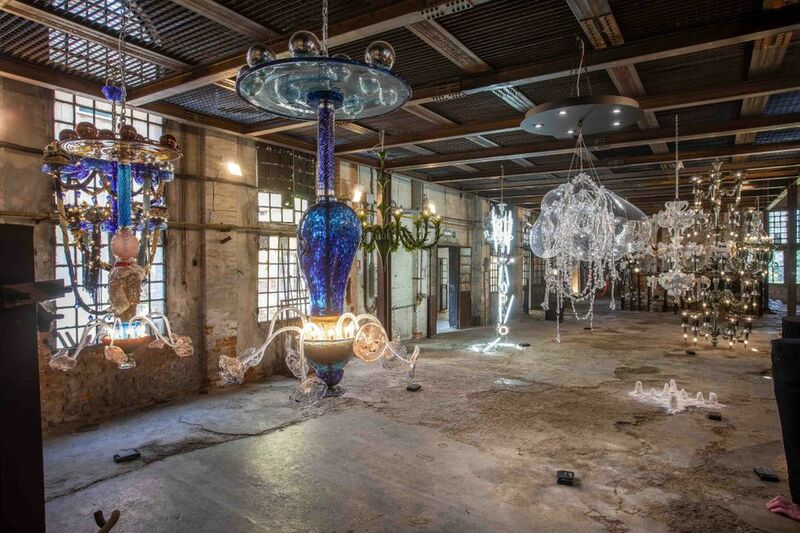 If, on the other hand, you go to The Venice Glass Week, from 9 to 16 September, you can be sure to see real Venetian glass because there will be over 100 exhibitions, all focusing on the best of 20th and 21st-century production. Commercial spaces and the not-for profits are aiming to show the range and quality of glass, from sculpture, vessels and architect-designed lighting to beads to micromosaics. The Stanze del Vetro, which have done so much to bring fine glass back to the heart of Venice, are exhibiting the geometrically shaped glass used by the 20th-century architect Carlo Scarpa, and the ancient techniques of reticella (networked) glass mastered by the Cappellin workshops in the 1920s and 30s. The recently restored civic museum of glass on Murano is also emphasising the architectural use of the material, with glass designed by the architect of the Islamic wing of the Louvre, Mario Bellini. The Louis Vuitton space is showing lighting designed by Barber & Osgerby, made in Murano. Matteo Seguso, of one of the most famous glass-making families, is exploring the art of engraving on glass—and so on and so on. There will be conferences, glass-blowing demonstrations and prize-givings. David Landau and his wife Rosi, who are prime movers in this collaborative event, also helped give the Murano craftspeople a crash course in the possibilities of their craft. They persuaded the US Glass Art Society (GAS) to bring its annual conference to the island in May, with 1500 glassblowers, designers, artist, collectors and dealers. The Muranese realised that the process of making glass is as much a performance art in the US as a craft, with an audience of hundreds for a master glass-blower in action. The island craftsmen, on the other hand, like medieval cathedral builders, have traditionally hidden the secrets of their craft, making their glass behind curtains. Murano glassblowers need to leave the lower end of the market to the Chinese and make the transition to being artists, says Landau; in the US, when you buy a piece of handblown glass, you get a certificate with the name of the designer, if there is one, the person who blew it and even the assistant. After all, should we not know who the Murano glassblowers were who made the highly individual glass marionettes for Wael Shawky’s successful Cabaret Crusades (2014)?